Start with slices of potato on a square of aluminum foil. Add a hamburger patty, with generous amounts of salt and pepper. Add a slice of onion, sliced carrots, and then top with more potato slices. Close the aluminum foil around all ingredients to make a pouch. The pouch is then placed over a campfire, on a grill, or in the oven. Cook for about 40 minutes until the potatoes and carrots are soft. Be sure to turn the pouch over at the half way point. The fat from the beef will keep the food in this hobo dinner from drying out and burning. This recipe is what we use when there are more than 5 of us around the campfire. The ingredients are the same as the traditional hobo dinner recipes. Instead of individual pouches, everything is combined into on large cast iron pot with a lid. The cook time is about the same. 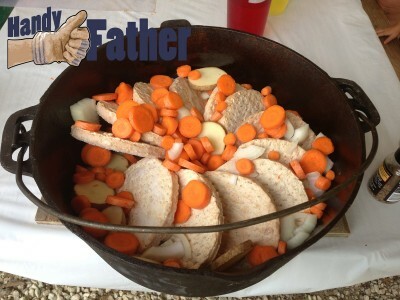 Hobo dinners are a favorite of kids and adults alike. Kids love them with ketchup. Some people like them with Miracle Whip salad dressing. Get a Texsport Pre-Seasoned Cast Iron Dutch Oven without Legs (Gray, 2 Quart) for cooking your hobo dinners. Tilapia Hobo Dinner recipes – Another variation of the hobo dinner that we enjoy is to use tilapia fillets in the pouch. Usually we add some paprika as well. The cook time is a bit shorter, as you don’t want to over cook the fish. Chicken Hobo Dinner recipes – The last hobo dinner we make is with chicken, cooked the same way as with the traditional hobo dinner, except that chicken is used, and taco seasoning is added. This hobo dinner version is best with a fiesta blend of cheeses, salsa and sour cream. Like the fish, we always make this hobo dinner in pouches. It also cooks well as a casserole. Do you have any hobo dinner recipes that you’d like to share? Comment below! We used to eat these quite a lot as kids down at the lake. Does that make us hobos?